Mission appears to be given out only by agents outside of Gallente and Minmatar factions. There are 5 Pods when you warp in, one of them is not damaged (highest pod vertically, info description: "A life pod from a long since destroyed ship"). Approaching this pod will trigger a message and spawn a container. Loot the passenger Oura Madusaari, needed to unlock the acceleration gate. You will encounter periodic damage from the anomaly from about 5km in, 5 hits of ~200 to 400 damage each. 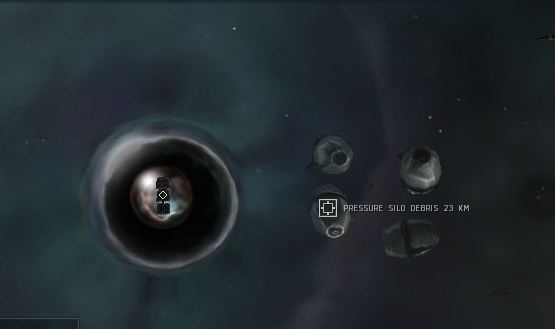 Destroy the Pressure Silo Debris structures, the one closest to the Anomaly will drop 2 containers. Loot the objective item, Dr. Fajah Ateshi. Bring Oura Madusaari to skip the life pods and go straight through the gate. Destroy the Silo closest to the Anomally and ignore the rest. Loot the container. Fitting a Micro Warp Drive or Afterburner is recommended. Approaching the other four damaged Pods will also trigger a message and the Pod contains a Stranded Pilot (not needed to complete the mission). Using Combat Drones to kill the Debris Silo may kill them. Sentry Drones will take damage but survive. The Debris Silos drop T1 ammo, the explosion causes 800 omni damage. I'm naked and I'm walking the blue-painted halls at military academy, and it's okay because everyone gets hazed like this and I'm in better shape than all of them so I'm not ashamed, except this means they can see the scars twining from my back and down to my knees like snakes, and what starts as laughter turns into confused whispering and sounds of pity as they realize how recently I was a slave, and I want to kill them slowly just like I did the man who gave me the scars, but I just walk on, seeing only red. He promised we would go to the beach on my birthday, so we went, even though it was raining, even though we didn't know where mom was again. I was collecting shells, and I found one that was perfect and round and smooth but then I looked back to the shore and saw him just standing there, the first time I'd ever seen him cry, and I wanted to say something but couldn't, just stood there, frozen, the shell crunching in my fist, and I looked down and my hand was bleeding but I didn't feel it at all. They called me to identify the body, and I told them she divorced me last year but they didn't care because she had no friends, no family on the planet at all. I went in and they pulled back the sheet and she was there beautiful like she was asleep, and my full name was carved delicately into her left arm like calligraphy, the blood dried like rust on parchment. Every time I closed my eyes for a full year after I saw that. I still miss her. "You have failed your family," he tells me with gentleness I know he's incapable of feeling. "You have dishonored us. You know what to do." And I know that the honorable thing is to fall on my sword like a good girl, so I take it out and push it through his chest and show him exactly what I think of his precious honor. I will never have to apologize again. Place the "Neurowave Pattern Scanner" you received from your agent in the Anomaly to complete the mission. When approaching the Anomaly (30km) it will spawn an Amarr Cruise missile battery. There is no need to destroy it, as when you approach the anomaly, a message appears and it ceases firing. Pressure Silo Debris drop Ammo. Last ship killed in each group triggers a spawn. Attacking any group will aggro the entire pocket, spawns remain passive unless attacked. The acceleration gate to the next pocket will become functional once the two Batttlecruisers from Group 2 are destroyed. Destroy the two BCs (Crippler/ Striker Alvatis) in group 2 to "spawn" the acceleration gate. The gate is not locked, but warp scrambling frigates will prevent you from using it. Use an afterburner to make your way to the rogue drone ship and drop Fajah Ateshi into the can which completes the mission, no drones have to be killed. The Anomaly is 30- 50 km away from the warp-in. Dropping Fajah Ateshi inside the "Rogue Drone" ship next to it completes the mission and leads to the destruction of the (Orca Class) "Anomaly" a few seconds later. Alternatively you may put Fajah Ateshi inside the "Anomaly", it will disapear (jump out probably) and mission will be completed with trying to save the crew. Attacking and killing the scrambling frigates did not cause the additional spawn. Attacking one of the Sunder Alvi did however. If you can one shot the frigates the spawn will not appear. Loot + Salvage: ~1.5 mil. Did this in a Tengu. It's basically a rogue drone bonfire with a LOT of T2 salvage. Enjoy! Beware: CCP's already started nerfing this mission. Expect it to be regular deadspace rogue drones next time it's back. Activated gate, hit stop ship. Big mistake. Dont do this mistake on first mission. Consumes the guy and u cant get him again. Can definitely confirm the CCP nerf. No more T2 salvage regular deadspace rogue drones. Be careful of drone aggro with spawns. 1/3: This mission gives you a lot of LP and a good reward for blowing up a silo. The correct silo the one in the back on the left side. 3/3: The gate to the second pocket only appears after you get a message from Fajah; this message seemed to be triggered by killing a certain ship. I didn't get the spawn in pocket 2 despite killing the initial group. On all missions: the anomaly deals some damage which does not appear in the combat log. When you add the dude to the anomaly, the anomaly collapse into something that drains your cap pretty hard. And you most likely need to fly out of it first to warp, since it keeps bumping you. Is this an Amarr-only mission? Unlocked accel gate by destroying the two BCs in group two. Yeah I just got it in Caldari space too. I think the text changes if you get it in Caldari space, I could've sworn the Amarr version mentioned a Caldari salvage ship instead of the Caldari version saying "one of our salvage crews". 3/3 Done in Rattlesnake + Basilisk combo today. Confirmed dropping fajah into Anomaly transforms it from a wormhole-like visual to a bright blue gas-cloud visual. The anomaly did not seem to drop my cap or do any damage even though my Basilisk had already left to get his noctis. It did however prevent me from warping out until i got about 20km from the object. The supposed 'delayed-spawn' spawned immediately for me. The only thing i think may have triggered it was targeting and killing the Supreme Alvus Preserver first. I have heard of a report from someone that they had a Crusader insta-popped from 2x2000EM environmental damage on 2/3. Can anyone else confirm this? It may be advisable to take in a well-buffered ship if this is tha case. some of the frigates seem to be scramming and webbing. sadly i dont remember which group or spawn due to trying to get my abaddon out. i like to pronounce fajah like how dr evil says father on austin powers, it amuses me... on a side note, just did this fairly easily in a raven with an AB, wasnt concerned with spawns, just shot at everything. the elite drone in the first pocket webbed me. I just lost a Manticore in 1/3 Pocket 1 and had to fail the mission. Extremely heavy environmental damage upon warp (acidic cloud from the lossmail) in from the jump gate. I was insta-popped before I even came out of warp. Bring something with a good EM buffer for part 1 of this mission! I got the spawns in 3/3. When i loaded Fajah over to The Anomoly, it dissapeared and an electric cloud apeared, but rendered me no damage. Mission 1/3 seems to have changed. No pods list as damaged. The 3rd escape pod I visited, farthest "north" if gate faces north, spawned a cargo container containing the person. Cloud dmg is only ~36 x2 with 82% EM resists. In 3/3 both pockets had a Strain Render Alvi scram/webbing. Group 2 had different names but unlocked the gate. All done easily in a T2 fit Drake. Use a MWD if possible. @SaikouAkuma - check the 'show info' details and you will see the damaged messages. Might want to add that Pressure Silo explosions will destroy drones now. Mission has been hit by the nerf bat in terms of it's loot. In mission one, the Silos only drop a mixture of standard ammo for each weapon system. In 2, Silos reappear even though you destroyed them in the first mission, they still drop ammo as before, although there are now only 3. 3: as described and no T2 salvage anymore. Warping out of part 1 does not stop you from warping back in. In Part 3, there is no mention of web/scramble ship in Pocket 1. There is at least one. I was trying the Blitz instructions, and the scramble came as a nasty surprise. Strain Render Alvi warp scrambles. Spawn 1 in Pocket 1 appears either when killing the first BS or when shooting at it, 'cause I had the second BS of Group 1 alive, and the other 3 BS from spawn where there. In pocket 2, you can't simply fly to the anomaly, group 1 has auto aggro. There are 2 different spawns here aswell with independent aggro. In part 3, pocket 1, there were two Strain Infestor Alvi in group 3. This was in addition to the 4 normal frigates (I think). One of them warp disrupted me and one of them webbed me. 'gate key' (Oura Madusari) is not consumed when using gate. also, if you have "type" column on your overview the correct life pod is easily identified, but i grabbed the 4 other "stranded pilots" just for good measure. (dropped a 100mn mwd in the raven. 20-30km distance between pods). tanked for EM in the pocket, damage was minimal (in a raven) "buildings" dropped a variety of t1 ammo. confirming exactly as described. tank for the damage (EM), fly 30km (ignore missle battery, it does turn off. do note however that I received a 55k bounty for shooting it ! ), place cargo, leave. t2 fit raven omni tank using t1 mjolnir cruise missile (200+km range). landed (initial groups are 30-50km from warp-in), turned around and immediately MJD 100km away. killed off initial ships on a first come first served basis. then aggroed the spawns. and again closest ship loses. shields never dropped below 95%. nothing even made it to my drone range(57km). no loot, 1.2m salvage, 5.6m bounties. initial ships at 10-20km did same as above. results same as above. another 700k salvage, 3.3m bounties. battleships hit very hard if they get into range. the last couple of BS actually made it into drone range and until then my shields sat at 99%. dropped to around 75% until I popped one of them. My favorite mission, its very easy and i recommend reading the mission and following the story. Mission could be done very fast and easy.